tasty bites // mmmm sriracha fries! We love simple, especially when it comes to food. However, to do something simple, does not always mean it’s just a thrown together creation. There are rules, folks. So stick to em’, if you want to end up on top. Take these fries, for example. Sure, you could just grab a bag from the store. Or if you are slightly more ambitious, grab a bag of taters, and get to cutting. Either way, most folks would just toss those suckers straight into a bubbling pot of oil, and wait for the magic to happen. But, we say no! This is not the way. Not that we don’t appreciate a fried treat every once in a while, it’s just that there are better ways, friends. Healthier ways. Tastier ways. 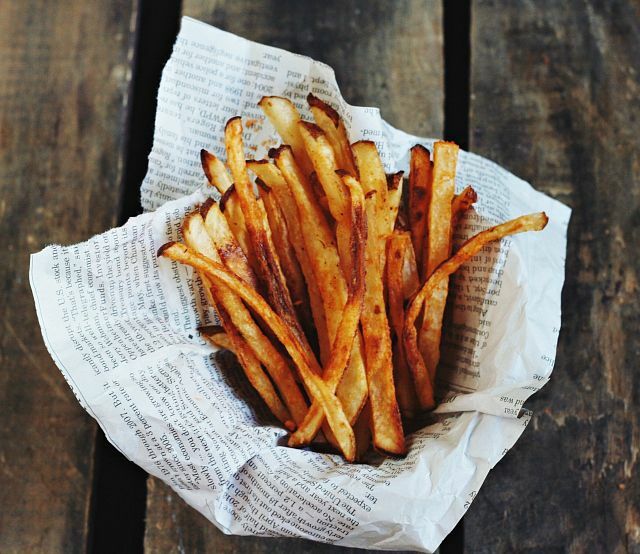 Simpler ways, to get tasty frites. Please allow us to show you the way. Did we mention that they are covered in salty, spicy sriracha-flavored, goodness?! OH YES. You can thank us later. Place potatoes in large bowl and cover with cool water. Let sit for 30 minutes, dump water and cover again. Let sit for another 30 minutes. * *This step removes the starch and allows the fries to get crispy in the oven. Dump water and towel dry potatoes. Combine oil and sriracha. Toss with fries. Place on two large baking sheets in a single layer. Sprinkle with sriracha salt. Place fries in oven and bake for fifteen minutes. Using tongs, move fries around so they can bake evenly. Return to oven. Check on them again after 10 minutes. Continue process until fries are golden brown, crispy and cooked through. Remove from oven and let cool slightly. Enjoy! Want more Tasty Bites? Go here. Also, if you are on instagram, be sure to follow@birdandclever for more fabulous photos.